We are SO passionate about spreading the word about sustainable seafood! So, we’ve created 3 free printable activities to help kids (well, any age really!) learn how to navigate the sometimes confusing world of seafood. Almost everyone loves seafood in one form or another: whether it’s fried shrimp, grilled salmon, or lobster tails dipped in butter! We could start a good old-fashioned drool fest thinking about the lobster we had in Maine, or the fish-n-chips in San Juan Island! Seafood is one way that we have a direct impact on the health of our oceans: some types of seafood are ocean-friendly while some are not! Our ocean is in serious need of re-balancing, and we each can play a significant part in helping it. It’s pretty empowering to know that we can help tip the ocean towards better health when we choose only sustainable seafood. So, we’re here to help get the message out with the help of our art from our children’s books! Our activities are kid-tested from 1st grade to 12th grade and adults love them too. The activities go hand-in-hand with Seafood Watch resources, making them a powerful way to apply and practice how to choose ocean-friendly seafood. Plus, they target science standards (see NGSS standards are at the bottom of the post). Even if you’re not a teacher, they are so easy to do with the kids in your life! We highly encourage you to share these activities with your pod, and spark real positive change that our ocean needs! You can laminate the sheet so that you can reuse them by having students use a dry-erase marker as they work. 3. Download free Seafood Watch cards from SeafoodWatch.org for your class OR you could have students use the SeafoodWatch.org website. We used the national guide for this activity. Have students work in groups or pairs to decide whether each item is a “yes” (Best Choice or Good Alternative) or a “no” (Avoid) for the chef to include on the menu. Different fishing methods, the fish’s biology, and environmental impacts are all factored into this categorization. Notice that some types of seafood show up on more than one column! For example, yellowfin tuna is on both the good alternative and avoid list, depending on where and how it was caught. Same with mahi mahi, lobster, cod, and many more! At the time of this post, here are the answers below (using the national guide). Be sure to check the current guide, though as it changes depending on current research! You can keep it going by asking more examples that aren’t on this sheet, making a list for your local area consumer guide, or have them find out what seafood they eat at home is categorized under. Of course, you can jazz it up by pretending to be a chef, having students dress up with chef hats, and dramatizing on the cooking theme! 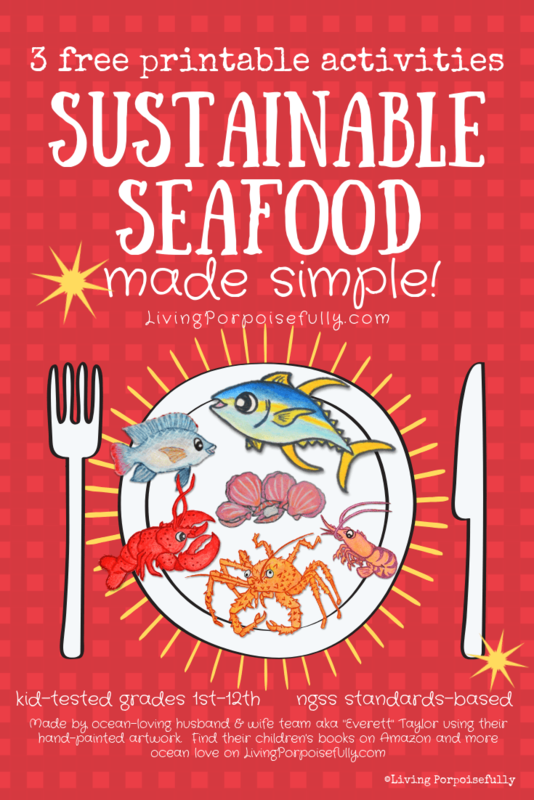 It’s such a fun way to have students of any age learn and apply that there are good and bad seafood choices that impact the health of our oceans. How do you know which packaged seafood is ocean-friendly and which isn’t? Our packaged seafood sorting activity will help guide the way and make it clearer as to what to look for in the grocery store! We’ve rounded up 21 examples of seafood packages that you might find in the grocery store to give kids (and adults too!) practice in detecting which packages are ocean-friendly. OR, you can print the pages, laminate them, and use red and green bins (or just piles) to make it a hands-on sorting activity! Some packages have both front and back, so just stick those back-to-back. With 21 examples, you can divide the stack and students into 3 groups and then swap stacks. Once kids (and adults) have the chance to practice, they’ll be much more aware and confident when they head to the grocery store! You can also send parents the link to this website so that when their kids come home, they can pull it up too and see what it’s all about, helping to reinforce the learning for the whole family. This final activity digs into more about why each particular seafood might be categorized as “best choice,” “good alternative,” or “avoid.” It reveals the behind-the-scenes into why some seafood is ocean-friendly and some are not! With the help of the Monterey Bay’s Real Cost Cafe interactive, we’ve created 12 different “plates” with the dish on one side and the behind-the-scenes on the other. Our artwork from our children’s books helps put a face to the dinner! Based on what the back of the plate says, students will decide if it is an ocean-friendly seafood choice or not. They can use the “good” and “bad” resource pages and bins from Activity #2 above to sort the plates. The chef character can of course be carried into this activity too, which makes it so fun! You can divide the students and plates to do this as a group activity, and then rotate plates or have students explain to the class their reasoning. Like all of these activities, it reaches a wide range from elementary school to adults. There’s a bit more reading in this activity, so for younger students (grades K-2), you can modify by reading each plate (or just a few) as a class. Again, it depends on the particular farm, way it was caught, or other factors on whether it’s a good or bad choice. Some types of wild-caught shrimp are good (sustainable), while others are not! Other types of seafood are more cut-and-dry, like the orange roughy. Here is the pfd file to download the 12 Sustainable Seafood Plates (8 MB). A great way to extend these activities would be to research current efforts and investigate fishing and farming practices. This Fishing & Farming Practices page gives a great look into how the seafood is harvested. There are some positive efforts being made in improving some farming and fishing methods, and we hope to see more of that as the word gets out about the importance of eating only seafood that’s sustainable! Grades K-2: K-ESS3-3 Earth and Human Activity – Communicate solutions that will reduce the impact of humans on land, water, air, and/or other living things in the local environment. Grades 3-5: 5-ESS3-1 Earth and Human Activity – Obtain and combine information about ways individual communities use science ideas to protect the Earth’s resources and environment. Grades 6-8: MS-ESS3-3 Earth and Human Activity – Apply scientific principles to design a method for monitoring and minimizing a human impact on the environment. Grades 9-12: HS-LS2-7 Ecosystems: Interactions, Energy, and Dynamics – Design, evaluate, and refine a solution for reducing the impacts of human activities on the environment and biodiversity.